Liczba stron: 815 Jest to ujednolicona liczba stron, która ułatwi Ci porównanie długości książek. Każda strona Legimi to 200 słów. 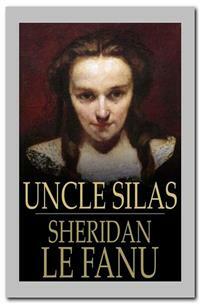 The most popular novel by Gothic mystery and thriller writer Sheridan Le Fanu, Uncle Silas is one of the first of the "locked room" mystery genre, and served as the inspiration for Arthur Conan Doyle's The Firm of Girdlestone. Teenage heiress Maud Ruthyn lives in a mansion with her withdrawn father. She slowly finds out that a man named Silas Ruthyn, a reprobate with a dark mysterious past, is her uncle, although he is now apparently a good Christian. Her uncle's mansion holds a locked room where a man to whom Silas owed a great deal of money allegedly took his own life. Maud's father is steadfast in upholding his brother's innocence, but Maud herself grows increasingly fearful and unsure. He was now walking up and down this spacious old room, which, extending round an angle at the far end, was very dark in that quarter. It was his wont to walk up and down thus, without speaking—an exercise which used to remind me of Chateaubriand's father in the great chamber of the Château de Combourg. At the far end he nearly disappeared in the gloom, and then returning emerged for a few minutes, like a portrait with a background of shadow, and then again in silence faded nearly out of view. While my father paced the floor, my thoughts were employed about the events of a month before. So few things happened at Knowl out of the accustomed routine, that a very trifling occurrence was enough to set people wondering and conjecturing in that serene household. My father lived in remarkable seclusion; except for a ride, he hardly ever left the grounds of Knowl; [pg 03] and I don't think it happened twice in the year that a visitor sojourned among us. I don't know that she had any better foundation than analogy and conjecture for charging my father with supernatural pretensions; and in all points when her orthodoxy was not concerned, she loved her master and was a loyal housekeeper. Mr. Bryerly arrived time enough to dress at his leisure, before dinner. He entered the drawing-room—a tall, lean man, all [pg 04] in ungainly black, with a white choker, with either a black wig, or black hair dressed in imitation of one, a pair of spectacles, and a dark, sharp, short visage, rubbing his large hands together, and with a short brisk nod to me, whom he plainly regarded merely as a child, he sat down before the fire, crossed his legs, and took up a magazine. His bed-room and dressing-room were at the side of the gallery, directly opposite to my father's, which had a sort of ante-room en suite, in which were some of his theological books. The day after Mr. Bryerly's arrival, I was about to see whether my father's water caraffe and glass had been duly laid on the table in this ante-room, and in doubt whether he was there, I knocked at the door. I suppose they were too intent on other matters to hear, but receiving no answer, I entered the room. My father was sitting in his chair, with his coat and waistcoat off, Mr. Bryerly kneeling on a stool beside him, rather facing him, his black scratch wig leaning close to my father's grizzled hair. There was a large tome of their divinity lore, I suppose, open on the table close by. The lank black figure of Mr. Bryerly stood up, and he concealed something quickly in the breast of his coat. I remember so well the kind of shock and disgust I felt in [pg 05] the certainty that I had surprised them at some, perhaps, debasing incantation—a suspicion of this Mr. Bryerly, of the ill-fitting black coat, and white choker—and a sort of fear came upon me, and I fancied he was asserting some kind of mastery over my father, which very much alarmed me. It is a long, narrow room, with two tall, slim windows at the far end, now draped in dark curtains. Dusky it was with but one candle; and he paused near the door, at the left-hand side of [pg 06] which stood, in those days, an old-fashioned press or cabinet of carved oak. In front of this he stopped. 'And have you promised, sir?' I answered, with another question, my curiosity and anxiety overcoming my awe. He took my questioning very good-humouredly. A person quite unacquainted with my father's habitually abrupt and odd way of talking, would have fancied that he was possibly [pg 09] a little disordered in his mind. But no such suspicion for a moment troubled me. I was quite sure that he spoke of a real person who was coming, and that his journey was something momentous; and when the visitor of whom he spoke did come, and he departed with him upon that mysterious excursion, I perfectly understood his language and his reasons for saying so much and yet so little. There had come now a little pause in my father's revelations, and my fancy wandered away upon a flight of discovery. Who, I again thought, could this intending visitor be, who was to come, armed with the prerogative to make my stay-at-home father forthwith leave his household goods—his books and his child—to whom he clung, and set forth on an unknown knight-errantry? Who but Uncle Silas, I thought—that mysterious relative whom I had never seen—who was, it had in old times been very darkly hinted to me, unspeakably unfortunate or unspeakably vicious—whom I had seldom heard my father mention, and then in a hurried way, and with a pained, thoughtful look. Once only he had said anything from which I could gather my father's opinion of him, and then it was so slight and enigmatical that I might have filled in the character very nearly as I pleased. It happened thus. One day Mrs. Rusk was in the oak-room, I being then about fourteen. She was removing a stain from a tapestry chair, and I watched the process with a childish interest. She sat down to rest herself—she had been stooping over her work—and threw her head back, for her neck was weary, and in [pg 10] this position she fixed her eyes on a portrait that hung before her. There was a remarkable elegance and a delicacy in the features, but also a character of resolution and ability that quite took the portrait out of the category of mere fops or fine men. When people looked at it for the first time, I have so often heard the exclamation—'What a wonderfully handsome man!' and then, 'What a clever face!' An Italian greyhound stood by him, and some slender columns and a rich drapery in the background. But though the accessories were of the luxurious sort, and the beauty, as I have said, refined, there was a masculine force in that slender oval face, and a fire in the large, shadowy eyes, which were very peculiar, and quite redeemed it from the suspicion of effeminacy. 'Is not that Uncle Silas?' said I. 'Yes, dear,' answered Mrs. Rusk, looking, with her resolute little face, quietly on the portrait. 'He must be a very handsome man, Mrs. Rusk. Don't you think so?' I continued. 'He was, my dear—yes; but it is forty years since that was painted—the date is there in the corner, in the shadow that comes from his foot, and forty years, I can tell you, makes a change in most of us;' and Mrs. Rusk laughed, in cynical good-humour. 'What's that, child?' said my father's voice, very near. I looked round, with a start, and flushed and faltered, receding a step from him. 'No harm, dear. You have said nothing wrong,' he said gently, observing my alarm. 'You said I was always sad, I think, about Uncle Silas. Well, I don't know how you gather that; but if I [pg 11] were, I will now tell you, it would not be unnatural. Your uncle is a man of great talents, great faults, and great wrongs. His talents have not availed him; his faults are long ago repented of; and his wrongs I believe he feels less than I do, but they are deep. Did she say any more, madam?' he demanded abruptly of Mrs. Rusk. 'Nothing, sir,' with a stiff little courtesy, answered Mrs. Rusk, who stood in awe of him. 'And there is no need, child,' he continued, addressing himself to me, 'that you should think more of him at present. Clear your head of Uncle Silas. One day, perhaps, you will know him—yes, very well—and understand how villains have injured him. 'Mrs. Rusk, a word, if you please,' beckoning to that lady, who trotted after him to the library. The air was still. The silvery vapour hung serenely on the far horizon, and the frosty stars blinked brightly. Everyone knows the effect of such a scene on a mind already saddened. Fancies and regrets float mistily in the dream, and the scene affects us with a strange mixture of memory and anticipation, like some sweet old air heard in the distance. As my eyes rested on those, to me, funereal but glorious woods, which formed the background of the picture, my thoughts recurred to my father's mysterious intimations and the image of the approaching visitor; and the thought of the unknown journey saddened me. When my dear mamma died I was not nine years old; and I remember, two days before the funeral, there came to Knowl, [pg 13] where she died, a thin little man, with large black eyes, and a very grave, dark face. Thus entertained, though a little awfully, I accompanied the dark mysterious little 'whipper-snapper' through the woodland glades. We came, to me quite unexpectedly, in the deep sylvan shadows, upon the grey, pillared temple, four-fronted, with a slanting pedestal of lichen-stained steps, the lonely sepulchre in which I had the morning before seen poor mamma laid. At the sight the fountains of my grief reopened, and I cried bitterly, repeating, 'Oh! mamma, mamma, little mamma!' and so went on weeping and calling wildly on the deaf and the silent. There was a stone bench some ten steps away from the tomb. 'Sit down beside me, my child,' said the grave man with the black eyes, very kindly and gently. 'Now, what do you see there?' he asked, pointing horizontally with his stick towards the centre of the opposite structure. I was uttering unconsciously very nearly the question with [pg 15] which Mary, in the grey of that wondrous morning on which she stood by the empty sepulchre, accosted the figure standing near. 'Oh! no, no, no—not now,' I said, resisting, and very much frightened. Of these Swedenborgians, indeed, I know no more than I might learn from good Mrs. Rusk's very inaccurate talk. Two or three of them crossed in the course of my early life, like magic-lantern figures, the disk of my very circumscribed observation. All outside was and is darkness. I once tried to read one of their books upon the future state—heaven and hell; but I grew after a day or two so nervous that I laid it aside. It is enough for me to know that their founder either saw or fancied he saw amazing visions, which, so far from superseding, confirmed and interpreted the language of the Bible; and as dear papa accepted their ideas, I am happy in thinking that they did not conflict with the supreme authority of holy writ. Leaning on my hand, I was now looking upon that solemn wood, white and shadowy in the moonlight, where, for a long time after that ramble with the visionary, I fancied the gate of death, hidden only by a strange glamour, and the dazzling land of ghosts, were situate; and I suppose these earlier associations gave to my reverie about my father's coming visitor a wilder and a sadder tinge. I stared in something like a horror upon the large and rather hollow features which I did not know, smiling very unpleasantly on me; and the moment it was plain that I saw her, the [pg 17] grey woman began gobbling and cackling shrilly—I could not distinctly hear what through the window—and gesticulating oddly with her long hands and arms. I stood breathless in the hall. Every girl at my age knows how much is involved in such an advent. I also heard Mrs. Rusk, in a minute or two more, emerge I suppose from the study. She walked quickly, and muttered sharply to herself—an [pg 18] evil trick, in which she indulged when much 'put about.' I should have been glad of a word with her; but I fancied she was vexed, and would not have talked satisfactorily. She did not, however, come my way; merely crossing the hall with her quick, energetic step. I was just making up my mind to go to Mary Quince, and learn something definite, when I heard my father's step approaching from the library: so I quietly re-entered the drawing-room, but with an anxious and throbbing heart. Here honest Mary Quince, who enjoyed Mrs. Rusk's satire, a weapon in which she was not herself strong, laughed outright. 'And how is she named—what is Mademoiselle's name?' said the tall stranger. Madame de la Rougierre, I found, was always quite ready to explain everything 'à fond;' but somehow her 'explications,' as she termed them, were not very intelligible, and when pressed her temper woke up; so that I preferred, after a while, accepting the expositions just as they came. Madame was on an unusually large scale, a circumstance which made some of her traits more startling, and altogether rendered her, in her strange way, more awful in the eyes of a nervous child, I may say, such as I was. She used to look at me [pg 20] for a long time sometimes, with the peculiar smile I have mentioned, and a great finger upon her lip, like the Eleusinian priestess on the vase. There is not an old house in England of which the servants and young people who live in it do not cherish some traditions of the ghostly. Knowl has its shadows, noises, and marvellous records. Rachel Ruthyn, the beauty of Queen Anne's time, who died of grief for the handsome Colonel Norbrooke, who was killed in the Low Countries, walks the house by night, in crisp and sounding silks. She is not seen, only heard. The tapping of her high-heeled shoes, the sweep and rustle of her brocades, her sighs as she pauses in the galleries, near the bed-room doors; and sometimes, on stormy nights, her sobs. There is, beside, the 'link-man', a lank, dark-faced, black-haired man, in a sable suit, with a link or torch in his hand. It usually only smoulders, with a deep red glow, as he visits his beat. The library is one of the rooms he sees to. Unlike 'Lady Rachel,' as the maids called her, he is seen only, never heard. His steps fall noiseless as shadows on floor and carpet. The lurid glow of his smouldering torch imperfectly lights his figure and face, and, except when much perturbed, his link never blazes. On those occasions, however, as he goes his rounds, he ever and [pg 21] anon whirls it around his head, and it bursts into a dismal flame. This is a fearful omen, and always portends some direful crisis or calamity. It occurs, only once or twice in a century. I don't know whether Madame had heard anything of these phenomena; but she did report which very much frightened me and Mary Quince. She asked us who walked in the gallery on which her bed-room opened, making a rustling with her dress, and going down the stairs, and breathing long breaths here and there. Twice, she said, she had stood at her door in the dark, listening to these sounds, and once she called to know who it was. There was no answer, but the person plainly turned back, and hurried towards her with an unnatural speed, which made her jump within her door and shut it. When first such tales are told, they excite the nerves of the young and the ignorant intensely. But the special effect, I have found, soon wears out The tale simply takes it's place with the rest. It was with Madame's narrative. About a week after its relation, I had my experience of a similar sort. Mary Quince went down-stairs for a night-light, leaving me in bed, a candle burning in the room, and being tired, I fell asleep before her return. When I awoke the candle had been extinguished. But I heard a step softly approaching. I jumped up—quite forgetting the ghost, and thinking only of Mary Quince—and opened the door, expecting to see the light of her candle. Instead, all was dark, and near me I heard the fall of a bare foot on the oak floor. It was as if some one had stumbled. I said, 'Mary,' but no answer came, only a rustling of clothes and a breathing at the other side of the gallery, which passed off towards the upper staircase. I turned into my room, freezing with horror, and clapt my door. The noise wakened Mary Quince, who had returned and gone to her bed half an hour before. Mrs. Rusk's observation about the agreeability of new-comers I found to be true; for as Madame began to lose that character, her good-humour abated very perceptibly, and she began to show gleams of another sort of temper, that was lurid and dangerous. Notwithstanding this, she was in the habit of always having her Bible open by her, and was austerely attentive at morning and evening services, and asked my father, with great humility, to lend her some translations of Swedenborg's books, which she laid much to heart. At first these abrupt transitions puzzled me, sometimes half frightened me, savouring, I fancied, of insanity. The key, however, was accidentally supplied, and I found that these accesses of demonstrative affection were sure to supervene whenever my father's face was visible through the library windows. I should have been glad to be assured that she prayed when [pg 23] on her knees, or read when that book was before her; I should have felt that she was more canny and human. As it was, those external pieties made a suspicion of a hollow contrast with realities that helped to scare me; yet it was but a suspicion—I could not be certain. 'I don't think, child, you are the best judge of that. Go, and amend.' And with a displeased look he pointed to the door. My heart swelled with the sense of wrong, and as I reached the door I turned to say another word, but I could not, and only burst into tears. Two little pieces of by-play in which I detected her confirmed my unpleasant suspicion. From the corner of the gallery I one day saw her, when she thought I was out and all quiet, with her ear at the keyhole of papa's study, as we used to call the sitting-room next his bed-room. Her eyes were turned in the direction of the stairs, from which only she apprehended surprise. Her great mouth was open, and her eyes absolutely goggled with [pg 25] eagerness. She was devouring all that was passing there. I drew back into the shadow with a kind of disgust and horror. She was transformed into a great gaping reptile. I felt that I could have thrown something at her; but a kind of fear made me recede again toward my room. Indignation, however, quickly returned, and I came back, treading briskly as I did so. When I reached the angle of the gallery again. Madame, I suppose, had heard me, for she was half-way down the stairs. As I approached, I happened to look, I can't tell why, suddenly, over my shoulder; I was startled, for Madame was grimacing after me with a vile derisive distortion. She pretended to [pg 27] be seized with a fit of coughing. But it would not do: she saw that I had detected her, and she laughed aloud.